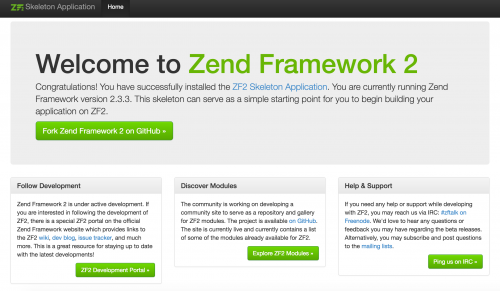 This article will provide an Introduction to the ZF2 Skeleton Application covering the basics that will help you understand the concept of how Zend Framework 2 can work in a real-world application. If you have downloaded the application and followed the installation process, you should see something like this when you load the page. So how does the ZF2 skeleton application work? Like with most PHP applications, the entry point is the index.php file. there are two of these files; one located in the root directort and the other located under the public/ directory. It is advised to configure your server to run the index.php file within the public/ directory to protect assets within your root directory. * to the application root now. Essentially, the index.php bootstraps and runs the application. The application.config.php file is a configuration file that contains global configuration about the ZF2 Skeleton Application. Notably, this is where you will add extra modules. // This should be an array of module namespaces used in the application. // This should be an array of paths in which modules reside. // provided by modules themselves. Paths may use GLOB_BRACE notation. // Whether or not to enable a configuration cache. // The key used to create the configuration cache file name. // Whether or not to enable a module class map cache. // by in future requests, to reduce the autoloading process. // The key used to create the class map cache file name. // The path in which to cache merged configuration. // Whether or not to enable modules dependency checking. // Used to create an own service manager. May contain one or more child arrays. // Initial configuration with which to seed the ServiceManager. // Should be compatible with Zend\ServiceManager\Config. The ZF2 Skeleton Application is modular, allowing you to re-use code and work with the components in your application. By default only one module, Application, exists within the framework. This can be seen within the modules/ directory. Each module should contain a Module.php file within its module/ directory. This file will contain methods to attach event listeners and include module-specific configuration. The Module.php file of the Application module can be seen below. The module-specific configuration is included within the getConfig() method. The getAutoloaderConfig() method includes configuration that will include the ZF2 standard autoloader that will autoload your classes within the src/ directory of your module’s directory. The module-specific configuration file, module.config.php of the Application module can be seen below. The routes configuration is defined under the ‘routes’ key. The Application module contains a ‘home’ and ‘application’ literal route type. The literal route type will do a simple string comparison. So a route matching “/” will by default load the ‘index’ action of the IndexController.php file located under src/Application/Controller/. Likewise the same action and controller will be used when the route matches “/application”. This can be seen by loading your ZF2 application without a route and with the “/application” route. You will notice that the same content is loaded. The IndexController.php is responsible for returning a new ViewModel instance. The created ViewModel will be matched with a .phtml template file with a name based on the module, controller and action. In the Application module, this will be application/index/index.phtml. The index.phtml is located under the view/ directory as per the configuration in the module’s module.config.php file under the ‘template_path_stack’ configuration key. The index.phtml template file contains a mix of HTML and PHP code to render in the browser. Now that the very basics of the structure of the Application module have been covered, you should be ready to create your own ZF2 module. Note: This article is based on ZF version 2.4.